As a place where metallic winged giants once soared meters from the washing lines of people’s tenement apartments, and where an unpoliced mini-city formerly survived outside of society without law or order, the noisy, gritty and captivating Kowloon Bay is a little spot where the Hong Kong of old still lives on. The densely packed streets of Kowloon City have always been some of the most active and stimulating in Hong Kong. The areas around To Kwa Wan, Ma Tau Wai and Kowloon Bay expose the real Hong Kong, in all its noisy, stark unadulterated glory. These are not the commercialized areas you’ll find in guide books, littered with skyscraping glass phalluses or tourists – these are the real streets and buildings where Hong Kong first began. Of course, one will never be able to say when the official ‘beginning’ of Hong Kong of truly was and, while one can happily trawl back through history books questing for answers, the exact date or the first settlers, or any concrete indicator of a ‘start’ will always be up in the air and lost in the sands of time. However, there are many signs that link the beginnings of modern Hong Kong with this seemingly paltry corner in north-east Kowloon. Formerly home to the legendary Kowloon Walled City and the once third busiest airport in the world (Kai Tak Airport), this special little bay has played a big part in writing the pages of Hong Kong’s history books. It is a gritty area of distinction where today one can still find living remnants of old Hong Kong scattered amongst characteristic buildings, interesting restaurants and all the sights and smells of a district rooted in the past – a district with scraps of history that deserve to be experienced. The historical importance of the area dates back to 1277, when the last two boy emperors of the Sung Dynasty took refuge from the soldiers of the Qing Dynasty. The fort where the boys sought shelter was later removed during the reclamation of land for the former Kai Tak Airport, but a rock inscribed with the words ‘Sung Wong Toi’ (meaning ‘Terrace of the Sung kings’) dating back to their time can still be seen today in Sung Wong Toi Garden. After the defeat of the Sung Dynasty, the same fort that the boy emperors sort refuge in was built into a walled garrison in 1847 as a symbol of resistance against the British, who had colonised Hong Kong Island and part of Kowloon. However, the colony did not extend to the New Territories until later, and with a large fortified wall and a bamboo fence (what is today Boundary Street in Kowloon), the suburbs behind the garrison became a place of iniquity untouched by the Brits. Even after the British later seized control of the garrison, it still lived on as a no-man’s land which developed into an enclave for squatters and triads. Over time the enclave grew organically into a mini-city and, as a place of refuge symbolically protected from China, it was loosely regarded as being outside of Britain’s jurisdiction. It is out of these confrontational foundations that the infamous Kowloon Walled City developed. Theoretically controlled by the British, technically owned by China and governed by anarchy, the city expanded on its own – an adult amusement park of dark thoroughfares and pathways where gambling dens, opium divans, brothels and unlicensed businesses, factories and clinics all managed to subsist until the vertical slum was pulled down and replaced by a park in 1994. The Kowloon Walled City held, and still holds, the attention of many. It was a living sociology experiment of such magnitude that will never be seen again. In 1987, the Walled City contained 33,000 residents within its 6.5-acre border. At its peak in the 1980s it was home to some 35,000 people – 35,000 humans packed into dense Jenga-like layers of makeshift apartment spaces broken up by labyrinths of corridors that rarely saw the light of day. Before it was demolished it enjoyed a short moment in the spotlight, heralded by films such as Long Arm of the Law (‘Sheng Gang Qi Bing’), Jean-Claude Van Damme’s film Bloodsport and Jackie Chan’s Crime Story. 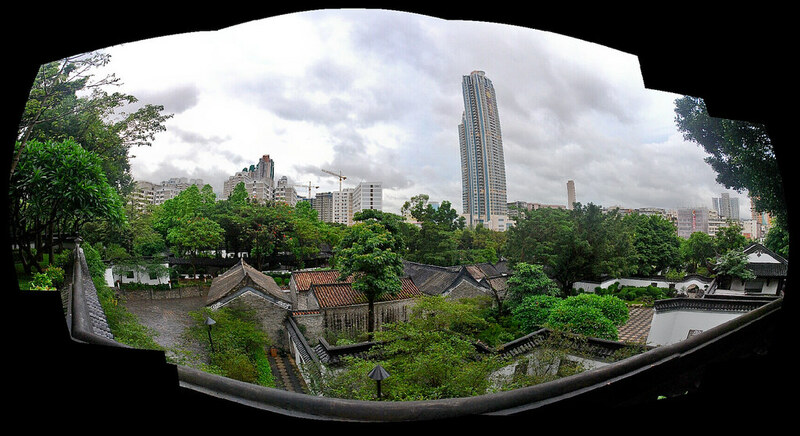 Today it lives on as Kowloon Walled City Park, where the foundations of the former walls, gates and other relics can be seen in the same spot where the living, breathing slum once stood. The Walled City is but one part of this area’s colourful past, as the bay was also home to the most unique airport in the world, Kai Tak International Airport, located 5 minutes away from the Walled City. Closed down in 1998, the airport was famously involved with the world’s first commercial aircraft hijacks (involving Miss Macao in 1948), and also linked with a foiled large-scale Al-Qaeda terrorist attempt in 1995. At one point it was also the third busiest airport in the world in terms of passenger traffic (it was designed to handle 24 million passengers per year, but in 1996 it handled 29.5 million passengers), and first in terms of international cargo throughput. 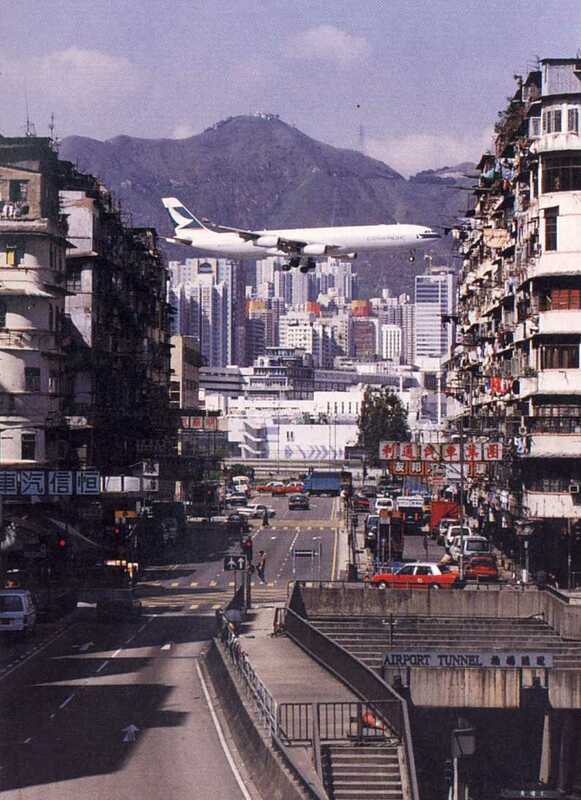 However, Kai Tak airport was recognized for more than just numbers. With numerous skyscrapers and mountains located to the north and the only runway of the airport jutting out into Victoria Harbour, landings at the airport were infamously difficult and provided quite an exhilarating experience for passengers. To land there, pilots had to manoeuvre planes over the crowded areas of Western Kowloon and then make a 47-degree visual right turn to line up with the runway at a height of 300-metres above the streets teeming with buildings and people below. As a result of this flight approach the area has always had low closely packed architecture, which was the upshot of a height restriction regulation. Although a few luxury apartments now litter the district, for the most part low height buildings remain, and the large open spaces around the former runway do not block the sea breezes making this area consequently cooler and divergent from the rest of Hong Kong. History lesson aside, there are big development plans in the works for this area and one should take the opportunity to check the area out before the development starts. The most recently published proposal envisions a massive cruise terminal, a sports stadium, a public park and some residential blocks. To accommodate the development in Kai Tak, the government has also planned to build a permanent 900-meter promenade in nearby Kwun Tong of which 200-metres has already been made. There is even talk of turning Kwun Tong into a futuristic domed city, with a giant glass sphere encasing residential blocks, a 200-meter tall office building, elevated green walkways, and even a manmade waterfall. It is clear to see nothing ever stays the same in Hong Kong, and when the bulldozing is complete the relics and the vestiges are all we have left – at least for now. mmmwaybe. where’s the link to your group?